I am just finishing up my Children's Nutrition course. Both of the required course books included lots of great kid friendly, healthy recipes. 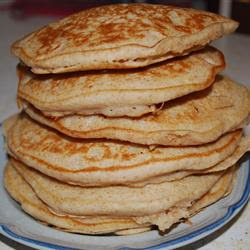 So, since my husband and the girls are all fans of a big breakfast on the weekends that always includes pancakes, here is an easy more nutritious alternative to a box mix that my kids loved. 2. Combine milk, egg, oil and vanilla and blend well. 5. Drop mixture by spoonfuls and turn when surface bubbles and bottom side is brown. 6. Serve with pure maple syrup, honey, sugarless jam, fresh fruit mixed with plain nonfat yogurt or fruit-flavored yogurt (without sugar), apple butter or unsweetened applesauce. When a couple of golden beets showed up in my box of organic fruits and vegetables two weeks ago, I have to say, I didn't really know what I was going to do with them. I like beets, but had never cooked them myself. My friend C. was industrious enough to look up a recipe using the beets when she received her Door to Door Organics order and passed this salad recipe along. I tried it myself and loved it so much I had it for dinner and then lunch the next day. Coat beets lightly with oil and roast for approximately 45 minutes, or until tender. Allow to cool thoroughly, then peel and dice. For the dressing, place lemon, vinegar, honey, mustard, and thyme in a blender. While blender is running, gradually add 1/2 cup of oil. Season to taste with salt and pepper. Place spring lettuce mix in a salad bowl, pour desired amount of dressing over greens, and toss to coat.Rinse endive, tear off whole leaves, and pat dry. Arrange 3 leaves on each plate. 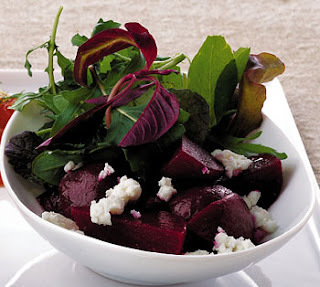 Divide dressed salad greens among them, and top with diced beets and feta cheese. Note: I didn't bother with the endive. I just put the spring mix on my plate, topped with the feta and beets and added the dressing. Shannan shared the Beet Salad recipe with me and we tried it last week. It was awesome. Now I'm hoping for more beets in my Door to Door Organics box! It was that good. I love beet salad and that one looks like a winner! Thanks!